Pedalling Squares: I'm a very lucky man. Forgive the typos, I'm enjoying a few seasonal snootfuls. I'll fix them later. It feels a little unseemly to post a blog about all the cool cycling-related goodies I got for Christmas, but in the absence of professional road races to write about there’s a strong possibility that I’ll be using reviews to keep the blog ticking over, so I should let you know what to look forward to. Clips and straps have served me well for the past couple of years, but the last time my devotion to cycling attained a reasonably feverish pitch was about five years ago, and I had SPDs back then, and I wanted them again. I must admit, I’m not looking forward to learning to use them all over again. I’m hoping the heel flick will be saved in my muscle memory somewhere, but I strongly suspect I’ve got some comedic sideways topples in my near future. Actually, I have four pedals, as my in-laws didn’t realise that the pedals are sold in pairs. Look at those shoes, how cool are they? I want to wear them every day, and damn your ruined parquet floors. I love the Giro. The Tour will always be the superior race, but only because of the the indefineables, the “je ne sais quois”. 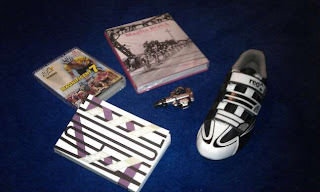 The Giro, on the other hand may come in second, but you can easily articulate all the reasons why it should come first: the unpredictability, the meat-flinging partisans, the Dolemites, and the sense of style. It’s that last one that’s shared by this history of the Giro from Rouleur. Look at that cover- the perfectly chosen photo, simple typeface and tidy dimensions. Anyone who’s found themselves paying through the nose for a copy of Rouleur magazine without even checking what’s inside it will already be aware of just how powerful good design can be. It’s nice to see that the same attention is paid to their books, especially when you know that words from Herbie Sykes mean that there will be substance to go with the style. That said, me and a Swiss army knife have so far failed to get through the actual packaging. An anti-novel, apparently. But perhaps not in the way its author thinks. My wife chose it for me based on the back cover blurb, which contains the line “a gripping tale of army snipers, nuclear espionage and competitive cycling.” It does dozens of things that they probably tell you not to do in novel writing class, and is really enjoyable because of it. Have you noticed how a slightly throwback, seventies look has become quite hip lately? This windproof top is the hippest thing I own. Slightly shiny, white and orange, fleece lining and zip pockets on the back. It’s beautiful. I’ve been complaining lately that it’s just too cold to stay out for long, but this should change all that. It occurs to me looking at this that when I started watching cycling, Channel 4’s coverage consisted of half an hour of highlights every day, for 21 days. I used to feel like my many, many highlight DVDs were merely a substitute for the actual TV coverage. It’s strange to think that 12 hour highlight DVDs mean that I’ll see more of the race now than I did when it happened. I’ve seen the odd documentary about the Race Across America, but this seems to be the definitive DVD on the subject. Cycling is such a telegenic sport, it’s hard to get the visuals wrong, but from what I hear Bicycle Dreams finds the story to go with them. I might stick this on later tonight, unless someone manages to mobilise a strong Downton Abbey/Strictly Come Dancing block vote. Ah, the vagaries of blog traffic.